He's big, smelly and a little past his prime, but should you happen to see a northern white rhinoceros named Sudan pop up on your Tinder, you might want to swipe right anyway. Sudan is the last male of the northern white rhinoceros subspecies (Ceratotherium simum simum). He's not on Tinder to find love — there are only two female northern white rhinoceroses left, and both live with Sudan at the Ol Pejeta Conservancy in Kenya. One, Najin, is too old to breed. The other, Fatu, has a uterine condition that renders her infertile. 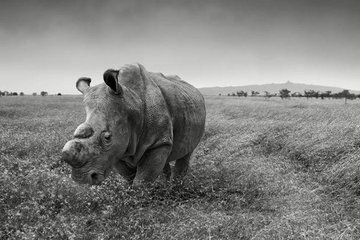 The northern white rhino has been pushed to near-extinction by habitat loss and poaching. Rhino horn is used as a status symbol and in traditional Chinese medicine, despite it being mostly keratin, the same substance that makes up human hair and fingernails. The last northern white rhinos seen in the wild were a group of four that lived in the Democratic Republic of the Congo's Garamba National Park. They haven't been spotted since 2007 and are presumed dead. Political instability and war across the northern white's former territory have contributed to the difficulty of protecting these rare rhinos. Meanwhile, the few northern whites in captivity are aging and beginning to die off. In 2015, the DvÃ…Â¯r Králové Zoo in the Czech Republic lost Nabiré, a 31-year-old female, to a ruptured cyst. Just a few months later, the San Diego Zoo had to euthanize Nola, its 41-year-old female, due to a bacterial infection that resisted all treatment. Sudan is 43 years old, and conservationists and scientists are racing to help him breed before it's too late. Rhinoceros IVF currently does not exist, so scientists are trying to tweak horse IVF to make the process work; horses and rhinoceroses are related, so they may have similarities in their hormones and uterine environments. Zookeepers and veterinarians harvested sperm and eggs from the surviving northern white rhinoceroses, and have already banked tissues from those that have died. At the San Diego Zoo, researchers are even testing methods to turn regular body cells into stem cells, which they then hope to coax into becoming sperm and egg cells. "We could have a source of eggs that we could actually produce in the lab," Barbara Durrant, director of reproductive physiology at the San Diego Zoo Institute for Conservation Research, told Live Science in 2015. All these efforts cost money, so Ol Pejeta has partnered with Tinder and the communications agency Ogilvy &amp; Mather for the dating-app effort. The goal is to raise $9 million to go toward assisted technology research in rhinoceroses. Though the two remaining northern white rhinoceros females are not healthy enough to carry pregnancies, researchers hope they can harvest their eggs, fertilize them and implant them in southern white rhinoceroses (Ceratotherium simum cottoni), a closely related subspecies. "Financial support remains the biggest challenge to this project. At 43 years, Sudan does not have much longer to live," Steven Seet, a spokesman for Leibniz-IZW, part of the research consortium, said in a statement. "To win this run against time it is very crucial to find major funds as quickly as possible." During this process, Ol Pejeta must also pay for round-the-clock armed guards to protect Sudan, Najin and Fatu from poachers. Organized criminal gangs have become increasingly brazen in the hunt for rhino horn. In February, armed men stormed a rhinoceros orphanage in South Africa and killed two baby rhinos while holding the staff hostage. In March, poachers broke into a zoo in France and killed a southern white rhinoceros in its enclosure.